Focusing on our home has taken a backseat since you know who came into town. But lately I feel like I'm starting to find pockets of energy and re-devoting some time into doing little things around the house. Maybe it's the hint of Spring? My mother-in-law reported seeing Snowdrops in her garden, which is always a good sign right? Inspite of the retreating groundhog, forecasters are predicting one more week of this god awful weather then things will start to pick up in a week or so and dare I say... warm up (fingers crossed)? I finally had a moment to take a pic of my recent DIY - I ordered a bunch of mini clipboards and used them as "frames" for my favorite shots of Emma Cate. I have about a dozen hanging on the wall along the staircase. They're currently staggered but I'm thinking a more symmetrical layout would probably look better (hello nail holes!) I used muslin fabric as a background layer, gives it a warmer less I-went-nuts-in-STAPLES kind of look and it also made it possible to include landscape photos without them looking out of place or too crazed. I know sometimes it can get a little too annoyingly perfect out in blogland, where most of what we see are perfectly edited and styled peeks of someone's life and home. Which is why I'd like to share a shot of my eat-in-kitchen table and tv console in the living room. Two things that bug the crap outta me but I haven't had either the time, energy or money to do anything about it! Hillsy and I usually eat our dinners on that table so it annoys me that I still haven't replaced those mismatched plastic folding chairs. You can also see the home of Emma's bright blue tub in the corner that always falls when I go to sit down. There's also a step stool behind the tub that you can't see. My least favorite of all, the tv center in the living room. Argh. I hate this thing. Why I decided to buy this open shelf atrocity from IKEA is beyond me, not sure what I was thinking. And why on earth does the cable box need to be that big? They can manufacture an iPod as thin as a credit card but I have to live with a box as big as a 1970s betamax?? What gives?? And yes, that is a very dusty Wii that Hillsy never really uses. Let's not even get into the clutter factor - Taboo? A box of hand weights? Ugh. What I would really like is a smaller unit with doors to hide all this crap behind. This just made it to the top of the Spring Cleaning list. I think that little shelf in the living room with the bunting and the tiny little lights is my favorite little vignette in your house. So sweet! You KNOW I love your home, my friend. You have a beautiful design aesthetic and you are SO good at making a home warm, cosy, interesting and lovely. It is one of my favorite places to relax, laugh and have the BEST cup o' tea. However, I LOVE that you also showed the spots that frustrate you. Cause ya keepin it real! :) And we all know how true that is about blog land, right? 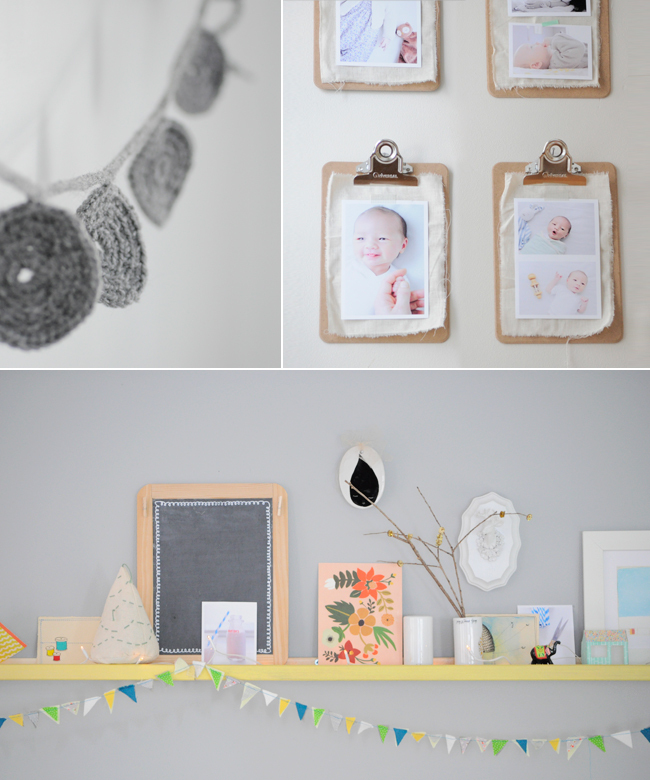 I just love that little shelf, the clipboard idea and all of it. Love, love, love the clipboard picture frames!!! Nice idea! Thanks for showing the pictures of imperfection along with the cuteness! Sometimes I wonder why I should even bother to make corners of my home pretty when there's bound to be clutter all the time, but I'm glad you're making the effort.